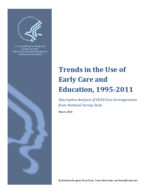 Public preschool enrollment increased for both children with married mothers (from 15 to 25 percent) and for children with non-married mothers (from 30 to 36 percent; marginally significant; Figure 25), although the children of married mothers were consistently less likely to attend public preschool and more likely to attend private preschool than children whose mothers were not married. Private preschool enrollment declined at similar rates for both groups of children (32 to 27 percent for the children of married mothers; 15 to 10 percent for the children of non-married mothers). For children with married mothers, there was a large gap in enrollment rates at public and private preschools in 1995 (15 versus 32 percent, respectively) that narrowed to a small, non-significant gap by 2011 (25 versus 27 percent, respectively).